Finally! My chive plants are in bloom…something I've been waiting on for almost a year now. The purple flowers you see are edible and can be enjoyed just like the green parts. Now is the time to prune them back a bit and get to cooking! Don't have chive plants at home? Ask a neighbor if you can borrow some of theirs.☺ The great thing about chives is that they will keep producing so you will have a constant supply year round (think grass). Since they taste like a mild onion (as do chives) they can be added to almost anything that needs a hit of something fresh…baked potatoes, soups, salads, wraps, pizza, omelets, etc., etc. They can also be frozen for later use; however, drying will cause a loss of flavor. Cut leaves about an inch from the soil and harvest often throughout the growing season to prevent the leaves from becoming tough. 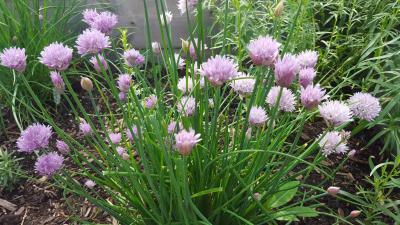 If you don't want your chive plants to self-seed and take over your garden…harvest the flower heads before they fade. For more on care and handling of the different varieties, check out the University of Illinois Extension Herb Gardening website. Chole is a type chickpea curry that you would find in Northern India. There are many variations to this recipe but the one I have provided is one I've been enjoying for years. It's made in the slow cooker so it's perfect for those busy weekdays when you don't want to spend a lot of time in the kitchen. I've been told this is the "best" chole dish from a good friend who happens to be Indian. It's full of protein and fiber with a heady blend of spices that will leave you wanting more. What better way to enjoy your chole this spring than with the edible flowers from your chive plants! This dish goes from drab to fab instantly.